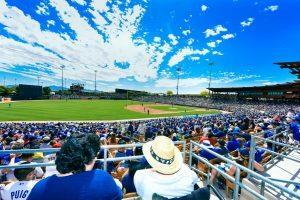 The best sports are always in season in Glendale and Arizona’s West Valley. The competition is heating up in Glendale and Arizona’s West Valley. From spectacular catches in the end zone and diving saves in the outfield, to edge-of-your-seat net play between tennis legends and the sweet sounds of the hard court during March Madness, when it comes to sports, no one does it better. Most recently serving as the host of the NCAA Final Four, Super Bowl 2015 and the 2016 College Football Championship Game, this district is a sports lover’s paradise. 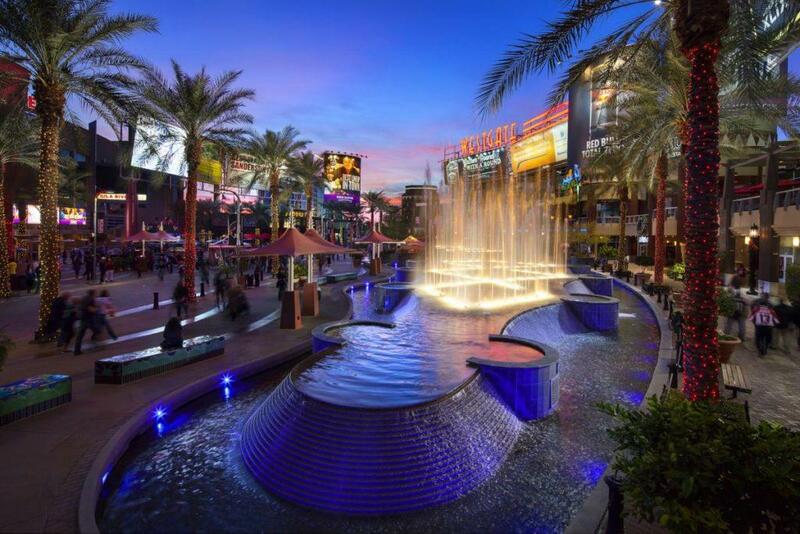 As the home of the National Hockey League’s Arizona Coyotes and the National Football League’s Arizona Cardinals, Glendale is a place where residents and visitors can immerse themselves in nonstop sports action and entertainment year-round. Head to the nationally recognized Gila River Arena to watch the Coyotes face off, or take in the football action at University of Phoenix Stadium, home of the Cardinals, Fiesta Bowl and the 2017 NCAA Men’s Basketball Final Four. 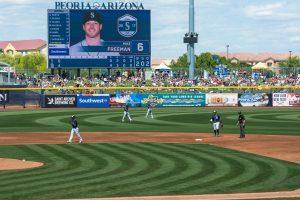 Glendale also knows a thing or two about another favorite pastime: Baseball, as Camelback Ranch is the Spring Training home for the Chicago White Sox and Los Angeles Dodgers. The Sports and Entertainment District is also home to Tanger Outlets Westgate, a collection of more than 90 high-end outlet shops. Spend the day walking through the shaded outdoor center just steps away from the action at the stadium, arena and the restaurants of Westgate. Home to the NFL’s Arizona Cardinals, this multipurpose stadium features the first fully retractable natural grass playing surface built in the United States. An opening on one side of the stadium allows the playing field to move to the exterior of the building, allowing the entire natural turf playing surface to be exposed to daylight and also allowing the floor of the stadium (the field measures 234 feet wide by 403 feet long and is 39 inches tall) to be used for other purposes. With 72,200 seats, 160,000-square-feet of contiguous exhibit space and 20,000 square feet of meeting room space, University of Phoenix Stadium has something for everyone. 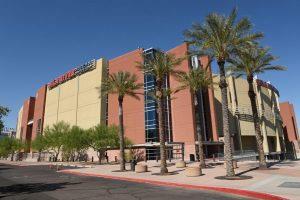 This state-of-the-art, multipurpose facility is home of the Arizona Coyotes of the National Hockey League. The arena anchors the 223-acre, $1 billion development Westgate Entertainment District, the crown jewel of sports and entertainment complexes. With two separate concourses on two seating levels, Gila River Arena’s open concourses are fan-friendly and provide an open view of the ice. The arena also features an intimate seating bowl that has all the modern amenities and seat 17,125 for hockey and lacrosse, 18,300 for basketball and offers 17,000-square-feet of event/ice floor space. 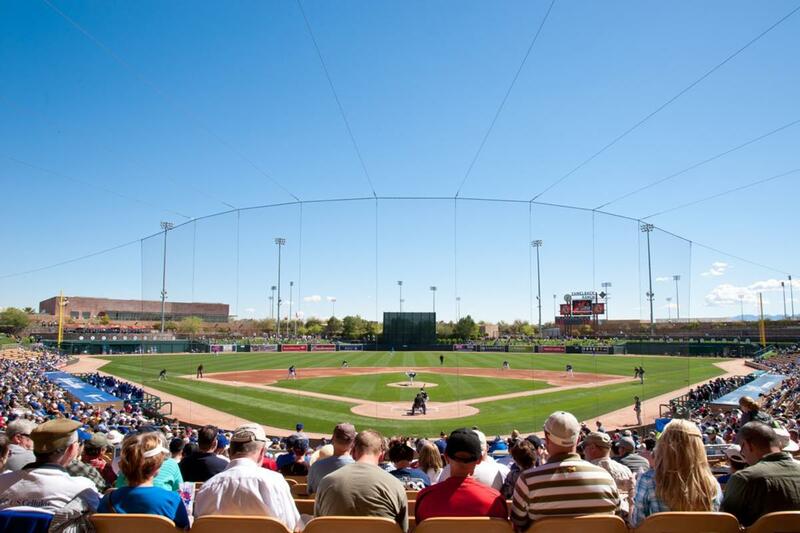 A baseball facility like no other, Camelback Ranch is the Spring Training home of the Los Angeles Dodgers and Chicago White Sox. Located on 141 acres, this Sonoran Desert-inspired, two-team facility offers baseball fans more than top-quality playing fields and facilities; the site also features picturesque walking trails, landscaped grounds and an orange grove. Guests will also enjoy water features and a fully stocked lake between the Dodgers and White Sox facilities. The facility includes more than 118,000 square feet of Major and Minor League clubhouse space, 13 full baseball fields and three half-fields. It is also the largest in the Cactus League with a capacity of 13,000, which includes 3,000 lawn seats, 12 luxury suites and a party deck. 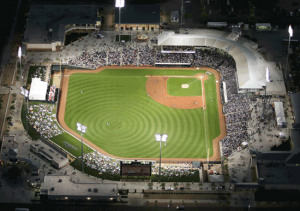 Fans enjoy the ballpark’s modern amenities and design as well as dramatic mountain views that create one of the most inviting Spring Training atmospheres in all of baseball. 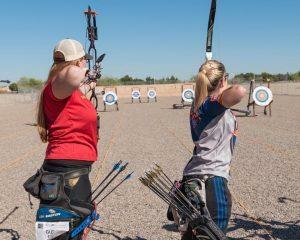 The Arc is a 16-lane practice and competition archery range for both novice and professional archers at Heroes Regional Park. The facility opened in the fall of 2016 and includes a 47,000-square-foot area with gated perimeter fencing, 16 archery lanes, an earthen target backstop, shaded spectator areas and landscaping. With three race weekends – including the Monster Energy NASCAR Cup Series in both the West Coast Swing NASCAR Weekend each March and the semifinal playoff weekend each November, and now the Verizon IndyCar Series race under the lights each April, fans are sure to create lasting memories with friends and family. 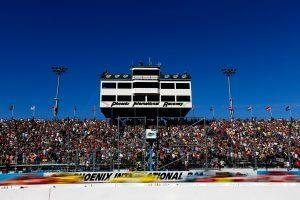 Schedules, facility information and tickets are available at www.PhoenixRaceway.com. 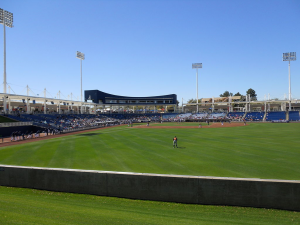 Major League Baseball’s Seattle Mariners and San Diego Padres train at this facility that features a capacity of 12,000 and 18,500 for festivals. The complex has 12 full-size practice fields (six lighted), four half fields, eight covered minor hitting tunnels, 30 practice mound galleries, and two clubhouses that span more than 55,000-square-feet each. This quaint facility is decked out in the blue hue of its MLB tenant, the Milwaukee Brewers, and seats 7,000 people. The ballpark features a recessed playing field and shaded concourse, offering an uninterrupted view of the action in an intimate setting. Host to MLB’s Kansas City Royals and Texas Rangers, Surprise Stadium seats 10,500 fans and has plenty of space on its wide 360-degree concourse to accommodate standing-room-only patrons. Each team has a two-story, 37,000-square-foot clubhouse nestled in an outfield corner. 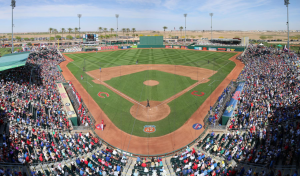 Home to MLB’s Cleveland Indians and Cincinnati Reds, Goodyear Ballpark holds 10,000 fans, with 8,000 in stadium seats, 1,500 on the outfield berm and 500 in the right field pavilion party deck. The ballpark also has room for 180 more patrons in the six suites that adjoin the press box. The park sits on 100 acres of practice fields that make up the recreational complex. 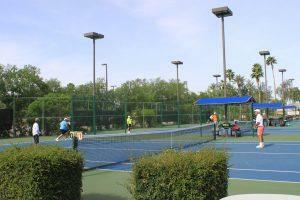 Glendale’s USTA award-winning tennis facility features 19 tennis courts, pro shops, lessons, camps and more. The park portion of the facility includes the Paseo Sports Complex with three lighted softball fields and one lighted multipurpose field. 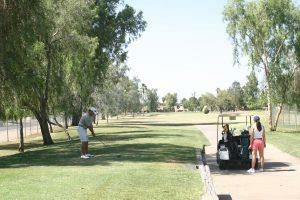 The Glen Lakes Golf Course and Learning Center and the Desert Mirage Golf Course are nine-hole executive courses with a wide range of programs and activities available. Glendale also features The Legends at Arrowhead, which was designed by golf legend Arnold Palmer, and is a par 72 course that measures 7,005 yards from the championship tees. The course possesses an exquisite layout set among six lakes, mature palm trees, numerous doglegs and bunkers at every turn. The city of Glendale hugs the western border of Phoenix and can be easily reached in many ways. 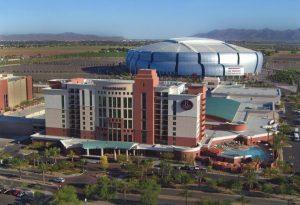 By car: Glendale can be accessed from Interstate 17, Interstate 10 and the convenient Loops 101 and 303. By air: Located just five miles west of downtown Glendale, and 30 minutes northwest of downtown Phoenix, the Glendale Municipal Airport and Phoenix Sky Harbor Airport (PHX) are the best options for out-of-towners.